There are certain things that you wouldn't think go well together, like chicken and chocolate, and yet Mole Poblano con Pollo is freaking fantastic. Today's Nice Price or Crack Pipe formerly air-cooled Porsche 914 seems a perfect mate for a wet and wild SBC, but does its price match expectations? Fully 88% of you were expecting a lower price on yesterday's custom Civichero, its dollar amount turning out to be almost as nausea-inducing as the car's paint scheme. Despite that Crack Pipe loss, the little Honda did represent an admirable adherence to a singular vision, which should be respected, even if the vision itself isn't worthy of the same. Today's candidate has also been heavily modified, but while that Civic was done up for show, this Porsche 914 as all about the go. Offered up in the Inland Empire city of Norco is this 15 pounds of Meth 1970 Porsche 914 which has seen its original Volkswagen 1.8 1.7 dropped in preference for an aluminum-headed SBC. Just like the seller of yesterday's Honda, the Craigslist purveyor of this Porsche loves the shoutiness of the all-caps. That's okay, as the description is only two paragraphs long, however his price seems to have been set in the same majuscule form. A word about that price however- in the Craigslist ad, the seller is asking 14K OBO, while in his 914World posting he claims he'll entertain any offer over 11. Fourteen is more than eleven so I guess that makes sense, but points off for the different prices Mr. SBC 914 man. We're going with the lower amount here, because that's how we roll. 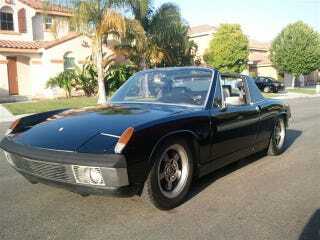 This 914 rolls not on steelies or Fuchs, but a set of Rivieras which are okay if you're into that sort of thing. The body is completely stock with the exception of a nicely integrated grille in the front bumper which provides airflow to the radiator now living in the trunk, as well as a pair of Chevy flag badges on the engine cover. Those are to let the uninitiated know that beneath lurks not a flaccid four but a 350-cid pushrod eight of the American persuasion. Behind the 8-ball is a 901 5-speed, possibly not the best choice to handle the ft-lbs the engine could potentially dish out - a 930 box is a more robust choice - but still common enough to rebuild should torquemada torture it to death. That may be on the horizon as he says in the 914world listing that it spots the garage floor. Inside the ‘70s cabin resides the stock 914 seats which are flat and only lightly bolstered, and as is the case in these, the passenger side is actually built into the firewall. Both face an engine turned dash and console that sports some additional Autometer gauges to keep tabs on the waterworks the car now carries. Everything looks tidy with the exception of a faux mouse fur dash cap that would only be attractive to a cat and adenoidal speakers sprouting from the footwell sides. The seller SHOUTS says that the paint is brand new, and the top still may be popped for that alfresco feel. He claims there's only 100 miles on the engine and that while he's been taking it slow - like the first few dates with someone you really want to bed - the occasional foot into it has resulted in some serious speed. For stopping, he says he has new rotors all around, as well as Bimmer clamps up front. There's also the typical litany of names you may have heard of when the talk turns to all things SBC - Edelbrock, Procomp, Chet Herbert, etc. All in all it's like a JEGS catalog come alive in there. That's all good, as is the fact that it remains relatively innocuous until you fire up the bow tie eight. You might get fired up about the whole concept of a turn-key V8 914, but then there'd have to be consideration of that eleven grand price tag, wouldn't there? But that's what we're here for - well, that and the camaraderie that anonymous posting from around the globe engenders. So what's your take on this SBC-powered Porsche for $11,000? Is that a price that is worth getting all all-caps about? Or, is this a 914 for which that's just too much green? Inland Empire Craigslist or go here if the ad disappears.